The easiest way to check your band size is to check the back of the band for any stampings that would indicate the size (like the sample below). 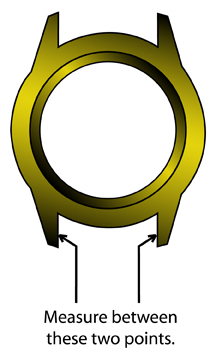 If there is no indication of the size on the back of your old band, then make a measurement between the lugs where the band attaches to the watch (like the sample below). NOTE: If you want to use your old buckle, measure the buckle width of the band the same way (between the points where the band attaches to the buckle). Use the conversion chart below if you do not have a ruler or measuring device that has millimeter settings. 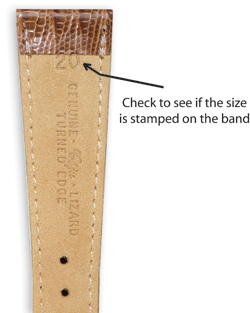 Determine the length of your band by measuring the length of both pieces together but not including the buckle (like the image below).